The Pike Poles come in 4,6,8,10 and 12 foot lengths. 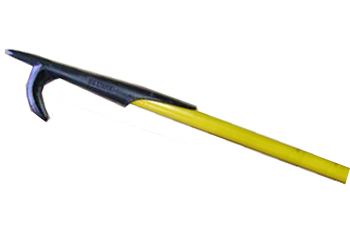 A Strong, conventional hook for quick and effective removal of ceilings, walls, moldings, door and window frames. This is the standard pike pole used by the New York City Fire Department. A new redesign of the pike pole made it lighter, shorter, fluted and streamlined, making it the best of its type. The head is made from malleable iron. The pole is 1 1/4 inch fiberglass over ash core. Please note that pike poles 10ft, 12ft and 14ft need to shipped by freight, therefore, the additional cost does include the additonal shipping. Please note that the 6' and 8' poles reflect the $12.50 additional UPS fee.